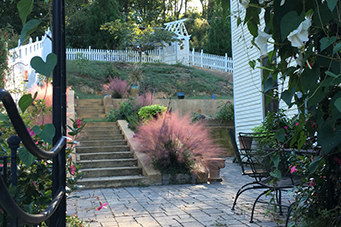 These specimens of Pink Muhly Grass in a private landscape demonstrate how the plant can accent garden and landscape features. Photo by T. Stebbins, courtesy UTIA. The renowned German plantsman Karl Foerster said that “grasses are the hair of Mother Earth”. Well, Mom becomes a punk rock star with Pink Muhly Grass (Muhlenbergia capillaris) in the garden. When the thousands of tiny bright pink flowers emerge in late summer, they add a floral electrical charge to the garden until frost. Muhlenbergia capillaris (pronunciation – mew len BER jee uh kap pill LAIR riss), commonly called Muhly grass, is an herbaceous, warm-season perennial grass, hardy in zones 6-11. It is native in a range extending as far west as Texas and Kansas and north into New England. The genus Muhlenbergia was named after one of the first early-American scientists, Lutheran minister and self-taught botanist, Gotthilf Henry Ernest Muhlenberg (1753-1815). More than 150 species have been described in this genus, but only a few are commercially available. Pink Muhly Grass, which is often sold as Purple Muhly Grass, certainly attracts attention in any garden. It grows from 1–4 feet tall with a 2–4 foot spread. The wiry, thin leaves are 18–36 inches long. It clumps but does not spread. The leaves are green throughout the summer and turn copper in the fall. The flowers are grouped together in long, light clusters that mature from the bottom up. They wave and shimmer in the wind. Individual flowers mature to oblong tan or brown seed less than half an inch long. Seed plumes are a food source for birds. Water new plants until they are established. After that, they’ll have good drought tolerance. Muhly grasses need well-drained soil to remain healthy and survive wet winters. They need full sun and dry conditions to look their best, and may suffer in shade or wet summers. Use just one or a few to add interesting texture to a perennial garden or border area. Try them on slopes to prevent soil erosion or use in rain gardens. Muhly grass also attracts beneficial insects such as lady beetles (Coccinella spp. ), and its clumping habit provides habitat for other wildlife. Plants can be cut back to the ground in late winter before the spring flush of foliage appears. If soil test dictates, give the plants an application of fertilizer as they begin to grow rapidly in spring. The most well-known Muhlenbergia is Pink Muhly but there are others with magnificent characteristics. The cultivar ‘White Cloud’ has white instead of pink flowers. The habit is more upright and open and blooms several weeks after Pink Muhly. Lindheimer’s Muhly – Muhlenbergia lindheimeri – is a 2-5 ft. perennial bunchgrass with fine foliage and a fountain-like form. It is a great choice for screening. It has an upright, fountain-like habit. The blue gray foliage reaches 4 feet, with purplish-tinged panicles adding another 1 to 2 feet in September. The blooms ripen to a silvery white. There is also a brilliant hybrid between M. capillaris and M. lindheimeri called ‘Pink Flamingo’. Gulf Muhly – Sweet Grass, Muhlenbergia filipes – is considered by some to be a variety of Muhlenbergia capillaris. It is somewhat shorter and blooms a later than Pink Muhly Grass. Young leaves are used by the Gullah African American population, who live in the Low Country regions of Georgia and South Carolina, to make traditional sweetgrass baskets. Growers and garden centers have a dilemma with Muhly grasses. If they sell them in September, when they look spectacular, customers will be disappointed since they transplant poorly in the fall and rarely overwinter with success. They should be divided, sold and planted in the spring when customers will only see a drab green grass to plant. In addition to the M. capillaris species, ‘White Cloud’ and ‘Pink Flamingos’ can be found in the UT Gardens, Knoxville. The UT Gardens in Jackson and Crossville also have the standard Pink Muhly Grass, but the hybrid ‘Pink Flamingo’ can also be found in Jackson.